Annotation: Lisabeth has been appointed Famine, the new Horseman of the Apocalypse, but how did she get there? Plot Summary: There’s a thin voice in Lisa’s head. One that constantly tells her how fat she is, how unpretty she is. One that counts the calories in everything that she eats, but it’s never enough. So she swallows a handful of her Mom’s pills and Death comes calling, but he doesn’t want her soul. Not yet. Rather, he offers her a job. One on a black steed carrying a set of scales. A rider of the apocalypse – Famine. This job and the powers that come with it takes her to far sides of the world where people are starving the point of death and to places when indulgence is plenty. Can Liza come to terms with the terrible power and will it help her battle with her inner demons? Critical Evaluation: This slim book about a young girl with an eating disorder is anything but trite. Kessler approaches a been-done topic with an uncommon premise of a girl suffering from anorexic who becomes Famine, one of the Four Horsemen of the Apocalypse. I love her approach in using the the Horsemen as allegories of issues that people face and it doesn’t feature supernatural romance, which is a nice relief. Famine is an analogy to Lisabeth as she struggles with anorexia. When she takes on the scales that represent Famine, she travels the world seeing people that indulge themselves to the point of gluttony and the flip side, the impoverished that starve to the point of death. Kessler is an impressive storyteller, as she describes in detail the physical agony of not eating, the mental battle for control and the emotional distress of never being thin/pretty enough. 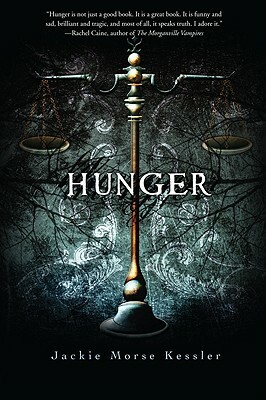 Hunger is obviously about the destructive impact of eating disorders, but what makes this appealing is that Kessler never veers into a preachy tone. She simply tells a story about food issues and lets readers come up with their own conclusions. Besides eating disorders, I appreciate Kessler incorporating global food issues as well. Additional notes and resources are included in the end for those seeking more information or help. A small book with a punch. Author Bio: Jackie Morse Kessler is the author ofthe the Riders of the Apocalypse quartet for teen readers, along with several paranormal and dark fantasy books for adults. She lives in upstate New York. Visit her website at http://www.jackiemorsekessler.com. Challenge Issues: Eating disorders occur mainly between 12 to 25, at least according to The Healthy Teen Project and ignoring it won’t make it go away. Kessler offers a new way for readers to engage with issues like anorexia and bulimia that does not sound like a sermon and offer places for resources should someone need help or looking to help someone. School Library Journal gave it a starred review saying “At the heart of this slim novel is a teen struggling with serious food issues, and the storytelling is both realistic and compassionate”.